Drying lotion may sound a bit absurd considering one often thinks of lotion as moisturizing, not drying. The term was coined by Mario Badescu (a super popular skin care line) along with the idea behind drying lotion. I remember when I first saw it while perusing my local make-up boutique. It looked so fancy and alchemy-ish like it belonged in an old forgotten apothecary. I had to try it because hey, if it looks that cool it has to work right? Well thankfully it did! Drying lotion is essentially rubbing alcohol, salicylic acid, and calamine lotion mixed together to form an interesting (and somehow expensive) concoction that magically shrinks blemishes overnight. 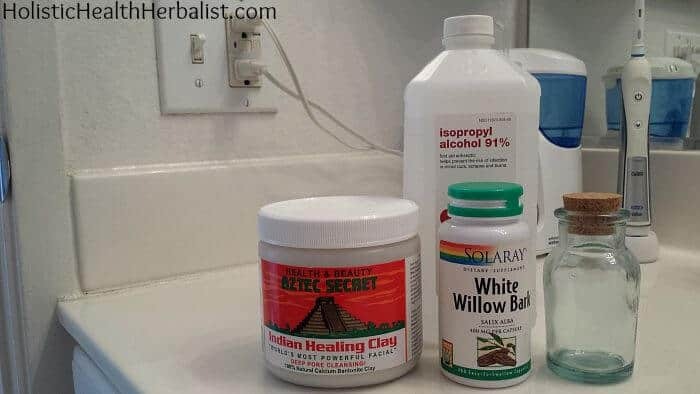 I’ve loved using this stuff on occasion for those cystic-type acne breakouts, but once I started running out it was time to make my own version. Forking out $18 for a new bottle seemed a little steep to me when it seemed really easy to make it myself. This stuff is so weird! I haven’t seen anything else like it. It’s basically a layer of sediment topped with a layer of rubbing alcohol. To use it you dip in a clean q-tip until you hit the sediment and dab it on blemishes before bedtime. The calamine lotion sticks onto the blemish while the rubbing alcohol/salicylic acid mixture goes to work drying out your offending zit while you sleep. Using rubbing alcohol on the skin may sound a bit too harsh, but we’re only dabbing a tiny bit on unopened blemishes. The alcohol will pull moisture from the area allowing the blemish to dry up and appear smaller, sometimes after the first application. I know from experience that I can get a zit to diminish almost completely after just a few dabs. 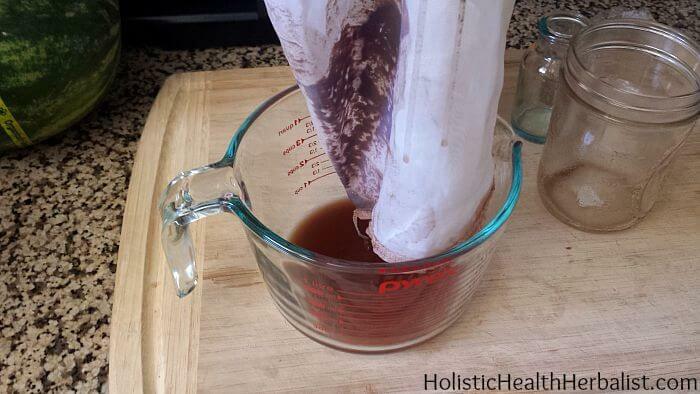 The use of rubbing alcohol as a method of extraction is nothing new in the world of herbalism either. 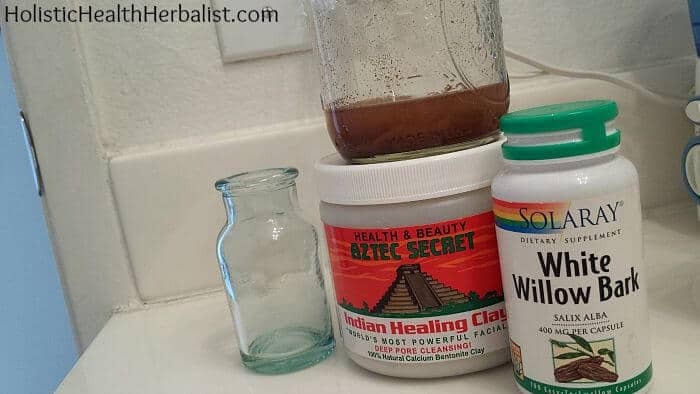 You add your herbs to the rubbing alcohol, let them macerate anywhere from a few days to a few weeks, strain, and apply to the skin as needed for joint pain, stiffness, and blood circulation, or you know….to shrink zits. 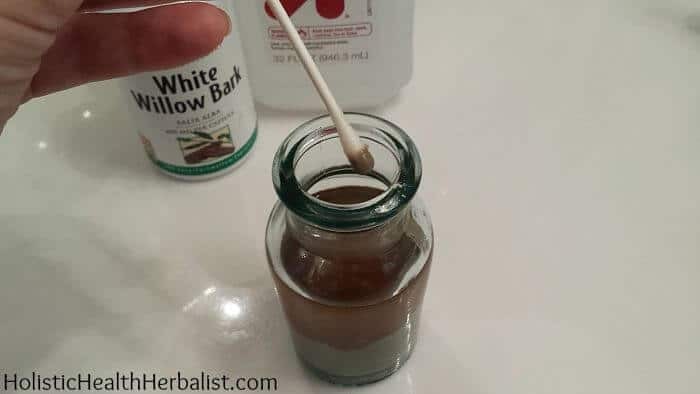 This preparation is known as an herbal liniment- a highly effective extraction method that uses rubbing alcohol as a means to pull therapeutic properties from herbs that rapidly penetrate and evaporate from the skin. Liniments are also highly antiseptic and disinfectant making them perfect for treating acne. Whatever herbs you use will be deeply absorbed into the skin allowing them to get to work! For blemishes white willow bark is going to be the best choice because it will increase cell turnover and regenerate the skin. • Once finished you can use it right away! When acne rears its ugly head, clean the blemish (you don’t want oils interfering with the drying lotion), dip a q-tip into the sediment at the bottom to coat the end then dab it on the blemish before bedtime. Be sure not to shake the drying lotion before trying to use it or it won’t work the same. For discreet day use, just apply the liquid part, wait for it to dry, and then apply your makeup. Also, never put this on open skin. It will burn like no tomorrow if you do! Otherwise this recipe is amazing and everyone should have it. 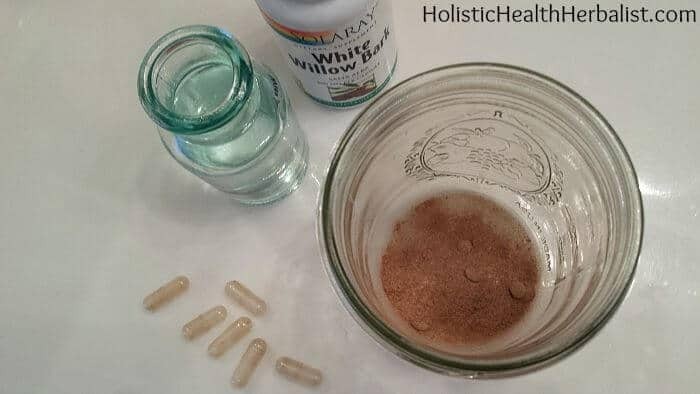 Would using white willow bark extract work the same? 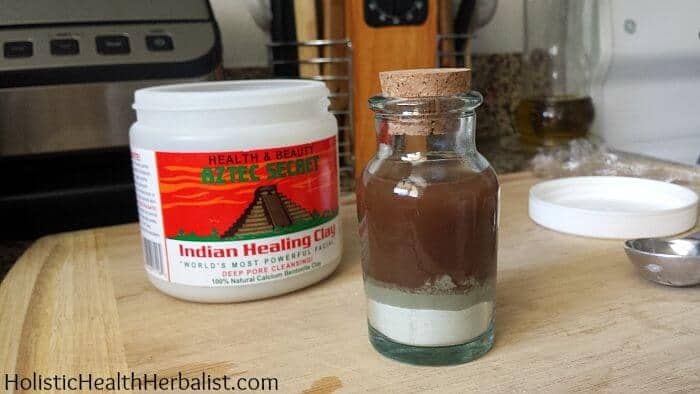 what is the measurement for the alcohol and the bentonite clay? Wow! 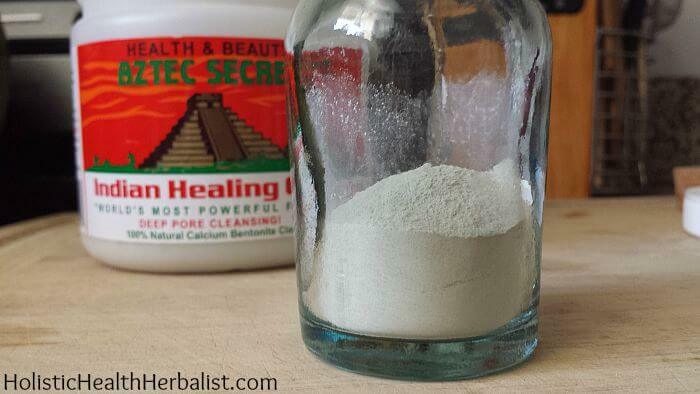 Cool post – I love DIY beauty products. The ingredients are much cleaner and usually cheaper too! This is so cool! I had no idea about any of it, and love learning from you. Thank you! ooo this is neat! i don’t have skin issues now that my diet is clean and i’m not pregnant off and on and nursing which totally messes with hormones! but i will keep this on hand in case i need it for any teens in my house in the coming years! We use clay for absolutely everything – including anything skin related. The addition of willow bark is a great idea! Thanks for the tip. 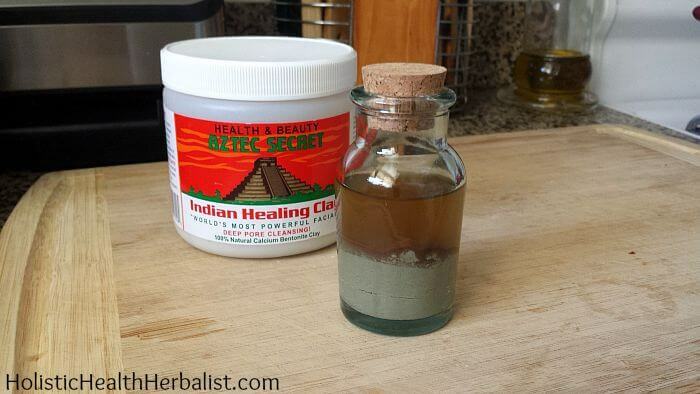 Love that Bentonite clay! Good for so many things!